My unusual 30-year career success as a start-up entrepreneur was built on two classic concepts: first, creating extraordinary moments of truth, then continuously surprising my customers through creative lateral thinking. When people talk about the customer experience, they are often thinking about customer service -- a smile at the counter, speed in delivery of products or services, front-line employees who have permission to be flexible and accommodating. This concept of the customer experience was popularized in the 1980s as the "moment of truth" by former SAS Airlines chief Jan Carlzon. The truly successful businesses succeed because the moment of truth is only the beginning. Successful companies create an initial customer experience that immediately delights the customer - then build on that positive moment of truth and continuously look for new and meaningful ways to surprise and support the customer. One of the most effective methods to find ways to surprise the customer is through "lateral thinking" - in essence, taking leaps of imagination so that instead of just building on what came before, you're going in a radically new direction. I never stop thinking of new ways to delight my customers. I don't want to just satisfy them, I like to blow them away. And in every industry I've ventured over the past 20-plus years, I have found ways to do just that. Within a few years, I had turned that one video store in rural Vermont into a chain of video stores - and each store was showing more profits than the stores of the giant in the industry, Blockbuster Video. Not surprisingly, Blockbuster eventually bought the chain from me for several million dollars; I took the profit from the sale, moved to California, and joined the dot.com boom. My success with Empire Video, as the video chain was called, was built on creating an experience for the video rental customer that he or she had never imagined. First, I opened the biggest, best-designed and most convenient video store in the state. However, a beautiful store with the best selection and easy parking was only the beginning. I inserted tiny video stores into general stores in the surrounding small towns so my customers could conveniently drop off their movies. Then I made free movies available to all of the community's schools, churches and retirement centers. Once I had built my brand and made my business the most popular video store in the state, I was ready to begin developing my most important and revolutionary customer service program. We called it movie matchmaking. Most businesses are more concerned with making a sale than they are with making sure their customers are happy with their purchases. At Empire Video, we focused on customer happiness, not daily sales. We took responsibility for making sure the customer took home a movie they were going to like. Too many customers take home movies from video stores that they don't enjoy, and we thought that was bad for our business. Movie matchmaking was our answer to this problem. Our multi-year experiment took many forms. We wrote our own reviews of the movies to give our customers a more honest perspective than the typical Hollywood sales propaganda that you find in the other video stores. We trained our staff to make them the best movie matchmakers on the planet by getting to know our customers and their tastes. We even sent customers to competing video stores if they had a movie our customer needed. Our bottom line was: We would rather have a customer walk out of our store empty-handed than have them go home with a movie they wouldn't enjoy. We even guaranteed all of our movie advice. If a customer ever disagreed with our recommendation, their next rental was free. Our obsession with caring for our customers made us the highest volume (per store) video retailer in the country. I radically changed the customer's moment of truth experience. And I did it more than once. In 2003, renowned marketing theorist and professor Philip Kotler applied lateral thinking specifically to businesses. For example, Kotler wrote in his book Lateral Marketing (co-authored by Fernando Trias de Bes), cereal makers have been inventing new varieties of cereal for decades. One company, however, invented an entirely new cereal product - the cereal bar - by asking provocative questions such as: Why should cereal be limited to breakfast? Why should all cereal be eaten in exactly the same way - in a bowl with milk? Is there a way to turn cereal into a healthy snack that can be eaten at any time of the day, anywhere? As I approached the industries in which I built companies, I was not afraid to ask similar provocative questions: Why can't customers return the videos to their general store instead of having to go back into town? Why can't a drugstore offer the best of both the Eastern and Western traditions? Why can't a drugstore include a health bookstore? Some critics knocked Kotler and de Bes's book as being too limited to marketing and product development. In a way, they are right. As I thought of my businesses, I did not think in terms of products, but in terms of business models. The new products and services that I offered were part of a grand vision for the companies I was creating. 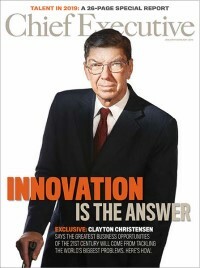 I never thought of simply creating innovative new products; my goal was to create innovative new business models. Marketing was part of it, but so was strategy and even human resources. Having grown up in a retailing family Stuart Skorman is a self-confessed serial start-up entrepreneur and founder of Reel.com and Elephant Pharmacy. He is the author of Confessions of a Serial Entrepreneur -- Why I Can't Stop Starting Over (Jossey-Bass/Wiley). He is currently working on two new Internet start-ups.